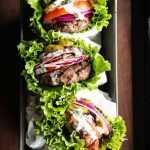 These paleo and Whole30 bunless burgers are as simple as it gets – kicked up with an easy cilantro dill mayo sauce! Add the mayonaisse, 1/2 tablespoon of water, dill, and cilantro to a small bowl and stir. If the mixture is still too thick for your liking, add an additional 1/2 tablespoon water. Cover and refrigerate until ready to serve to allow the flavors to meld. Turn on a gas grill, oil the grates, and heat it to medium-high (about 500 degrees F). Using your hands, combine ground beef, sea salt, and ground black pepper to a bowl. Be careful not to overmix! Form the beef into 4 thin patties. Grill the burger patties for 2 1/2 minutes on each side, flipping only once. Rest the patties on a plate for a couple minutes before crafting the burgers. To wrap the burgers, lay out a strip of parchment paper. Place 3-4 pieces of green lettuce on the parchment paper, overlapping a bit. Position the burger patty near one edge. Add tomato slices, red onion, pickled, and cilantro dill mayo sauce. Starting on one end, wrap the lettuce around the burger, using the parchment paper as a guide to help. Wrap the lettuce as tightly as possible, pulling back the parchment paper so it doesn’t get caught up in your burger! Fold the back of the parchment paper to contain the burger. Eat immediately.